I got home last night near midnight from DC. The meeting I attended in Washington was attended by about 25 key people who have been working on issues in the Asian-Pacific region for some time. 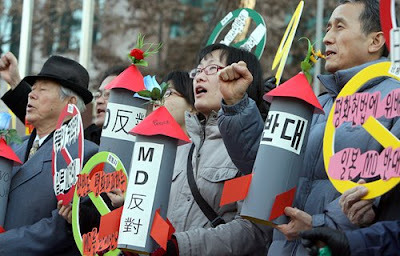 There were a number of activists from Korea there as we tried to come up with the best plan to bring the issues of a growing arms race in the region to a wider public. Today 65% of global military spending comes from the countries now involved in the six-party talks over North Korea's nuclear capability. These countries are North Korea ($5 billion military budget in 2006), South Korea ($22 billion), Russia ($35 billion), China ($50 billion), and the U.S. ($564 billion). So even though these countries talk about peace they are preparing for war - some more than others. The real question for me is does the U.S. really want peace in the region or are they out to drive this new arms race to increase weapons corporations profits and to surround China militarily in the coming years? How does the peace movement then develop a campaign that calls on these military powers to draw back from this dangerous military escalation? The global war system is eating up the resources that are needed to deal with the immediate reality of climate change. Economic conversion of the military industrial complex is not just an imperative in the U.S., it is a global imperative. No country can deal with the coming economic dislocation expected as a result of peak oil and no adequate national or international response to climate change will ever be possible unless we end the dominance of military over industrial production decision making. It was fitting this morning that MB and I went to the last vigil of the Lenten season at Bath Iron Works in our town. The disarmament vigils began on Ash Wednesday (Feb 6) and have continued each Saturday since - for a total of eight weeks. We gather in front of the plant just before the Saturday shift goes home at noon. Bath Iron Works builds the Navy Aegis destroyer that is being outfitted with "missile defense" interceptor systems and is being deployed in Australia, Japan, South Korea and very likely Taiwan. These ships, sold to the public as defensive, are in fact the shield in the U.S. first strike system designed to take out China's 20 nukes that are capable of reaching the west coast. Today I held a sign that said Windmills Not Destroyers. Some of the workers, driving by in a long slow line of traffic, honked or gave the peace sign. Some gave us the finger but most just looked straight ahead with no comment. One man rolled down his window and yelled out "I've got to work." Many workers do want to build something other than weapons for endless war. But they feel locked in and don't have much hope the peace movement can deliver the muscle to force the conversion of the military production system. What the workers don't yet see is how they must become engaged in the effort to force politicians to appropriate our tax dollars for windmills (and solar and rail and other sustainable technologies) rather than weapons. What they have yet to learn that is converting to peaceful production will in the end create more jobs for them and their neighbors. In the meantime the challenge will be to build an international consciousness that calls on all nations to convert their weapons production processes. Those running the global war system must be turned out of power if we are to survive as a people on this planet. Everyone must learn that the growing reliance on military spending is killing all our futures. I am in the airport preparing to board a plane for Washington DC to attend a meeting that is going to form a new coalition to work on Asian-Pacific issues. As I've written on this blog many times, the U.S. is arming itself to the teeth in order to surround and control China in the coming years. This reality is now causing virtually all other nations in the region to up-arm themselves in response and the concerns are growing about the obvious implications. The peace movement has not had much of a Asian-Pacific focus (due in large part to being quite bushed with the Iraq occupation) so the new coalition hopes to be able to begin to bring some consciousness and organizing to this neglected part of the world. Because of U.S. "missile defense" deployments in Japan and Australia, and Navy Aegis destroyers being outfitted with these systems, the Global Network for many years has been on this case. It is important though that others like Joseph Gerson (AFSC) and John Feffer (Foreign Policy in Focus), who have also long been key voices on Asian-Pacific issues, have a chance to bring their leadership on the region to a larger body. The Global Network will enthusiastically be a part of this effort. The meeting will last two days beginning with an educational forum this evening and strategy sessions on Friday. WHO CAN WE TRUST TO OPPOSE THE OCCUPATION? It's an old story in America. During the civil war the weapons corporations delivered inferior rifles to the soldiers of the Union army and they maximized their profits. We see the same thing happening today in Iraq and Afghanistan. I was watching CNN this morning and they had one of their top reporters on a quiet and deserted avenue in Baghdad reporting how calm everything was. In the distance you could see military vehicles blocking traffic from entering the street. The reporter was dressed in green military fatigues and a green military hat with CNN's logo on it. There is no pretense now. The corporate reporters have essentially been inducted into the military. They are mouth pieces for the military industrial complex. Forget their role as monitors of power - the checks and balances have all been rubbed out. CNN reported that as we now enter this 6th year of Iraq occupation up to 90,000 Iraqi people have been killed. Forget the numbers of 1.2 million Iraqi deaths that we hear from British medical sources. Forget similar numbers from Iraqi medical sources. We are seeing the white washing of the numbers by the corporate dominated media. Just as I had feared, as the Winter Soldier hearings began, there was only spotty publicity about them in the corporate controlled media. There were a few stories here and there but not anything near the earth shattering coverage of Obama's "wayward" pastor who told the truth when he said 9-11 was the "chickens coming home to roost." Fox News has just reported that "Sixteen Democratic members of the [Congressional] Out of Iraq Caucus stepped up to defend Hillary Clinton’s record on the Iraq war, issuing an open letter Tuesday asserting Clinton is the ideal candidate to bring the war to a 'responsible' end." What the hell does "responsible" mean? Names like Ohio Rep. Stephanie Tubbs Jones, California Rep. Lynn Woolsey and California Rep. Maxine Waters are saying Hillary is going to best end the occupation. Don't believe it. Don't believe it for a minute. I saw Hillary in Iraq a couple of years ago on Faze the Nation (CBS) with Sen. Lindsey Graham (R-SC) saying, "The American people need to relax. We've been in Korea for 50 years. We're going to be in Iraq for a long time." Sen. Graham turned to the cameras in that moment and said, "I don't often agree with Hillary on much, but on this I agree with her." This same Sen. Lindsey Graham was just in Iraq with Sen. John McCain and Sen. Joe Lieberman. During this trip the three were saying we have to stay in Iraq, that Iran is a trouble maker and has to be dealt with, and that we need more money to keep the occupation going. What is the difference here between these two war parties? Truthfully, what is the god-damned difference? How can the Out of Iraq Caucus throw in with Hillary knowing her real position? How can we let the Out of Iraq Caucus betray the peace movement in this way and continue to look to them for leadership? Don't we know that the only leadership that will stop this cycle of endless war is those of us on the streets all across this worn out nation? I know it all looks pretty damn bleak.....who can we trust and who can we turn to in these bad times? Well the answer is us.....we need each other and we need to turn to people who we know have been there on the street with us and who will remain on the street with us. That is the answer, that is the litmus test. Make a personal pledge, a personal promise as we wearily step into this 6th year of occupation. 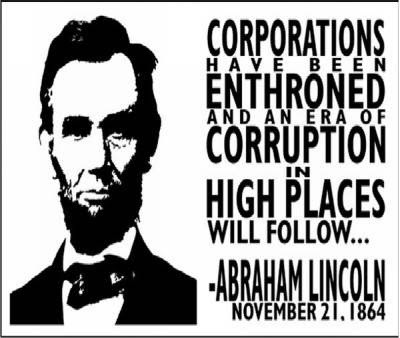 "I will not be fooled and led by these corrupt corporate controlled politicians. I will work and trust my peers who have shown their determination to end this madness by being there on the streets for the past five years. These are our leaders. These are our spokespersons." We are a military totalitarian dictatorship dressed up in three-piece suits posing as the world's greatest democracy. It's all lies. It's "friendly fascism" pure and simple - a wedding of the corporations and the government. The politicians in the war parties be damned. If you look closely at the photo above, of a protest in Minneapolis last weekend, (click on it for a larger version) you will see a banner near the back that says Money for schools not for war. This is a message that should be appearing everywhere these days. Other similar slogans in our marches and vigils should be Money for jobs not for war, Health care not warfare, Convert the military industrial complex, We can't eat Star Wars, Build mass transit not endless war, We can't live in a bomb, and so on. 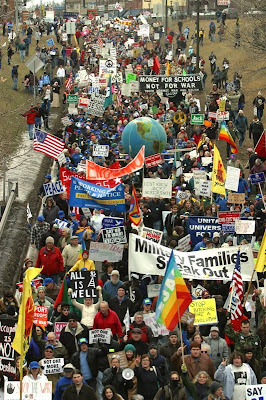 The peace movement is doing a pretty poor job of connecting the occupation of Iraq, now costing us $12 billion a month, to the public's concern about a declining economy, jobs moving overseas, and cutbacks in social spending. By now people get the "No more blood for oil message." They've heard that slogan for five years. What are we saying today that is relevant to their lives? Joanne Sheehan, regional organizer for the War Resisters League, arrived at our house last night for a meeting that we held about converting the military industrial complex. We are now doing preparations for a long-term campaign in our region of Maine about the need to transform Bath Iron Works from building destroyers (outfitted with "missile defense systems") to build rail, solar, windmills and/or other sustainable technologies. Our point is that research shows that spending money on weapons production creates less jobs than if we invested in any other kind of peaceful production. Joanne worked on economic conversion issues in southern Connecticut where she lives back in the early 1990's when the issue was big in the peace movement. At the time the Cold War was ending and people all over the country began talking about the peace dividend and started thinking about converting military production facilities. Even the International Association of Machinists, which represents many of the military production workers, was a leader at that time in the peace-labor efforts to bring conversion into reality. The reason that conversion did not survive the George H. W. Bush Panama and the Persian Gulf invasions was because we didn't do a good enough job of getting the peace movement to internalize the issue as essential to our being able to stop endless war. Weapons are presently the #1 industrial export product of the U.S. Today many local communities are economically dependent on military production. If we don't talk about economic conversion how will we ever end war? Now is the moment that the public is really casting about for answers. They fear the economic future more than they fear "terrorism." They know that jobs are becoming scarce and that opportunities for their children are drying up. Many are very responsive to talk about converting from a war economy to peaceful production. Many understand conversion means good and reliable jobs, a cleaner environment, and a more humane foreign policy that ends the need to wage war for oil. But is the peace movement talking about this? Is the peace community offering a transformative economic vision that builds a peace-labor-environmental-social justice movement alliance? Sadly the answer is no. By and large the peace movement is saying the same things we were saying five years ago - Bring the troops home now. That just does not cut it. We all need to stretch ourselves and begin to incorporate a positive vision of an economy that creates jobs and lessens the need for endless war. We've got to begin to link with the average American citizen who is worried about losing their home, paying for education, buying food, keeping the heat on, and holding onto their jobs. We've got to begin to talk about how military spending is killing their future and our nation. All of our local peace and justice groups should take this 5th year of Iraq occupation as an opportunity to organize local meetings to discuss making our opposition to endless war relevant to our fellow citizens. I'm afraid if we delay doing so we will be on the streets five years from now still holding signs that say No more blood for oil - Bring the troops home now!